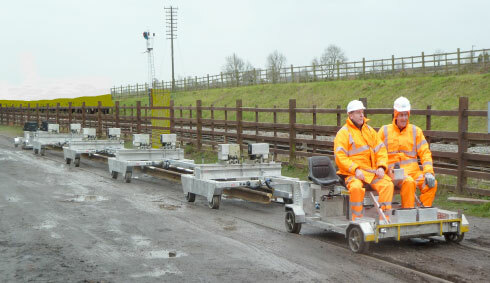 TRACTION POWERED: Two 4-Seat Alumicarts (model 4SBAC battery powered) pull-push from either end; geared for 8kph with 30km range before battery recharge. 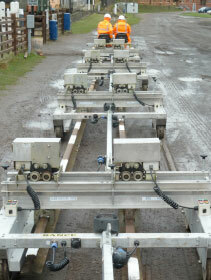 RAIL CARRIERS: 4 Traverser lifting units each with 2 x 1-tonne electric hoists and rail clamps linked by couplers all electrically powered from the traction units. BRAKES: Spring activated drum emergency and parking brakes. Fail safe, automatically applied when ignition is off, power fails or the linkage is broken. Manual release for uncoupled movement OR option for progressive stepped braking throughout. LIGHTS: White and Red LED markers on each corner lit according to direction of travel. 70W operating floodlight. 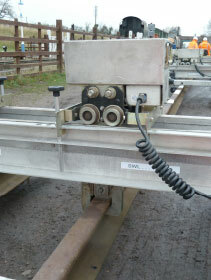 TOWING: 50mm tow ball both ends, coupled by special wired tow bars supplying electrics for brakes, lights and hoists power.